Updated Base Eclipse to 4.11 (2019-03). Debugger performance improvements (on Python 3.6 onwards). Mypy can be used for doing code analysis. Black can be used as the code formatting engine. It's possible to manage virtual environments from the editor (Ctrl+2, pip/conda/pipenv). Supported languages feature syntax highlighting, template completion, outline, select/deselect scope, comment/uncomment, auto-indent, linked edition, multi-edition, mark occurrences, among others. At this point, the major improvements are multi-edition and vertical indent guides, supporting all editors (such as PyDev, JDT, etc). Besides the multi-edition (which can be triggered in a Ctrl+K search or with the mouse with Ctrl+Alt+Mouse Click), the rectangular edit is also improved to be triggered with Alt+Click (and stopped with escape). 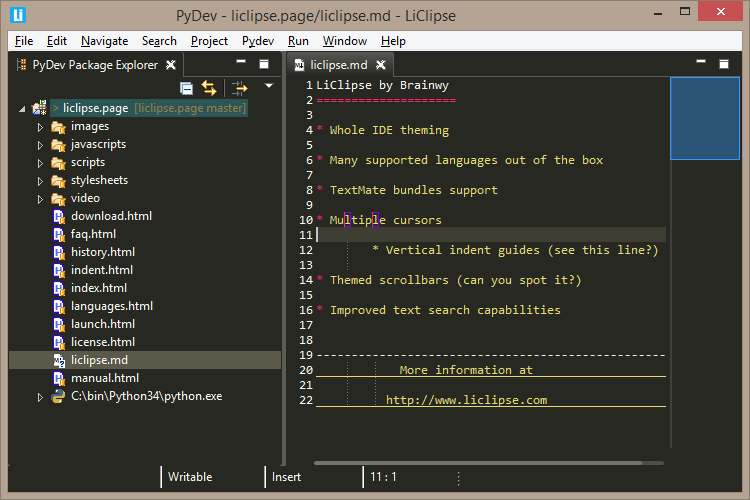 Eclipse has a myriad of useful plugins, and LiClipse bundles some which are considered to be useful regardless of which language you're dealing with: Eclipse Color Theme, StartExplorer, AnyEdit and PyDev (note that PyDev does not follow the rule of being useful for everyone as the other plugins, but LiClipse itself reuses parts of the PyDev codebase).